In some cases, if your carpet develops wrinkles there may be some recourse available for you either from the manufacturers new carpet warranty or from the carpet installation warranty provided by your installer or by the carpet retailer. If your carpet is fairly new and the carpet has a manufacturing defect, then you might have some recourse. Most carpet installation warranties are only good for one year. Some are two years and some are longer, depending on the carpet dealer you buy from or the carpet installer you hire. You will need to have this warranty in writing if you have any hope of getting any remedy. I don’t put much value in new carpet warranties because carpet manufacturers make it very difficult for homeowners to substantiate a valid claim. Even if a claim is approved, most carpet manufacturer’s warranties are quite limited. Have you read your new carpet warranty? It is an eye opening experience. Wrinkles caused by a Carpet Manufacturing Defect? Some carpets have a manufacturing defect that is due to a problem with the primary or secondary carpet backing. 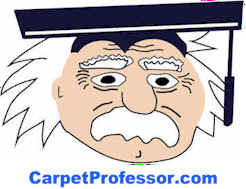 If the carpet backing does not have enough latex (glue) added to keep the carpet backing stable, then there can be a problem keeping the carpet in stretched tightly. A backing de-lamination problem is more likely to be found in lower grade carpets, like apartment or builders’ grade carpets. De-lamination is basically where the carpet backing comes loose and the carpet can lose its stretch over time. “Always ask your carpet installer to roll up and save all sizable carpet leftovers for you in case you have need of them sometime in the future.... Pet damage, cigarette burns, stains or other unforeseen accidents can be more easily repaired if you have some leftover carpet leftovers available for use”. Most carpet installations are warranted by independent carpet installers for just one-year. If the installer is an employee of the carpet retailer then you will get a one year installation warranty or perhaps longer, and some carpet retailers offer a lifetime carpet installation warranty. Lifetime means the typical life-span of the carpet, not your lifetime. Either way, you have to act fast or your warranty may run out and leave you holding the bag! It’s not always obvious who may be at fault for your carpet wrinkles and sometimes it may end up being your fault! But if you can determine who is at fault then you may have some recourse. Positive proof by means of specific details and photo documentation is often the key to success in getting some recourse, but even with some form of proof, it may be difficult to get the guilty party to agree to accept responsibility for causing your carpet wrinkles. Act quickly to avoid additional damage to your carpet. If the manufacturer denies your claim, then you need to have some accurate records and pictures of the carpet before and after to help back up your claim if you need to take it the next level. If you suspect that the carpet installer or the carpet manufacturer is responsible for your carpet wrinkles, then you need to contact the dealer where you purchased the carpet and ask for an in-home carpet inspection. If after a thorough in-home inspection by the carpet store manager and/or the manufacturer’s representative, they may determine that your carpet was defective or was improperly installed. Then you may have some recourse from the new carpet warranty or the installation warranty provided by the dealer or by the carpet installer. The key here is if the installer was an employee of the carpet dealer or was hired as an independent contractor. If it is determined that the installer is at fault, then the installer is allowed the right to inspect the carpet. If he agrees that it was his fault, then he must be given the chance to remedy the problem at no cost to the homeowner. If he disagrees, then you may have to get an independent evaluation by an expert and unbiased certified carpet inspector. In most cases, with an obvious carpet defect, your claim with the carpet manufacturer will be approved but limited. They may agree to replace a portion of your defective carpet, but only those areas that are affected. You may also be responsible to pay for furniture moving, re-installation costs, time off work and other costs and fees. If you do get some degree of recourse you should feel lucky as most homeowners never get any recourse at all. You must follow your carpet manufacturer's carpet cleaning guidelines to the letter if you want to keep you carpet warranty in force. You should hire a professional to clean your carpets every 12 to 18 months. Keep the sales receipts! Read your carpet warranty and follow the carpet maintenance suggestions to the letter. This is how you can make sure your carpet lasts as long as possible! Make sure you know which warranties apply to your particular carpet. Most new carpet warranties are shown on the backs of samples at the retail flooring dealer. It is your responsibility to know which warranties apply to the specific carpet you purchase. Most carpet warranties are available online for homeowners to read and download. Be sure to follow all manufacturer guidelines for carpet and maintenance or your warranty may be voided. Keep proof of purchase in the form of a bill, invoice, or statement showing the price you paid for the carpet, excluding pad and labor. Make sure your carpet is installed according to the guidelines set forth in the Carpet and Rug Institute's Installation Standard CRI-105 (Obtaining qualified installation can be quite a challenge too!). Maintain your carpet according to the manufacturer's warranty recommendations..
Keep a bill, invoice, or statement as proof of periodic cleaning by a Certified Carpet Cleaning Company. Always seek professional legal advice if you want to seek a legal remedy if you can't get a satisfactory resolution to your carpet complaint from the responsible party. Make sure you have everything you need to substantiate your claim. Be sure you know who is responsible for the cause of your carpet wrinkles. You surely don't want to sue the wrong party as you will likely lose your case. I suggest you take pictures of your new carpet right after it is installed, and then take more pictures periodically, especially right before and after a professional carpet cleaning. Taking pictures and documenting everything you can may be the only way to have some form of proof of who is responsible and to prove the timeline of the condition of your carpet before and after a carpet problem arises. Keep every professional carpet cleaning receipt and document every phone call you make and note the date and time of everyone who you speak to, when seeking a remedy to a carpet complaint. Many Carpet warranty claims are denied because the homeowner has no viable proof! If you ever have a need to go to small claims court to prove your case, having lots of before and after pictures and a well documented list of names, dates and times of phone key phone calls, emails and texts may help you win your case!